We are excited to announce that the International Women’s Festivals are expanding and YOU are needed! Qualified volunteers from around the world are now able to support the work of the Women’s Festival by starting a Festival in their city! This year we welcome Shanghai, SHERO Women’s Festival in March 2015 and past successes have resulted in Women’s Festivals in Santa Barbara, Sedona, Arizona, the Cayman Islands, Ireland and Africa. You can now continue the legacy and promote the awareness of crucial issues facing women. Your Women’s Festival will be set up to celebrate the accomplishments and the potential of women and to empower women and girls around the world. Most festivals take place in March, during Women’s History Month and or on International Women’s Day which is always March 8th. You can find the guidelines and requirements here to produce your own live or virtual Women’s Festival. It is our goal to enable others who wish to promote and advocate for women’s issues and empowerment to start a Women’s Festival in their towns! Is it your turn? The 2015 Theme is BE The Change and we hope your event will strive to powerfully impact the Personal and Professional lives of your attendees, presenters, sponsors and exhibitors. 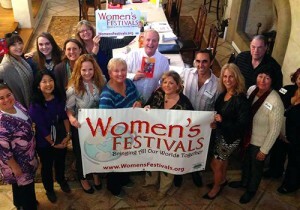 Women’s Festivals can facilitate gatherings for women’s self-empowerment worldwide. To learn more about how you can start a Women’s Festival in your city, please access the Women’s Festivals Handbook (coming soon). We encourage prospective presenters to prerecord on a variety of media platforms to create a diverse, interactive and entertaining virtual experience. YouTube, Vimeo and webinars are just a few examples of the many modes your presentation, seminar or performance can take!